This script allows you to use conditional branches to act as an additional page condition. It only supports one conditional branch, but it allows you to specify more things and gives you a script box as well. You have an event that should only appear if Eric is a Monk. The easiest way would be to specify a page condition that checks whether Eric is a Monk, but unfortunately such a page condition doesn't exist. You can solve this problem by cleverly using a set of parallel events to check Eric's class, and then remotely set self-switches to show the proper event page. 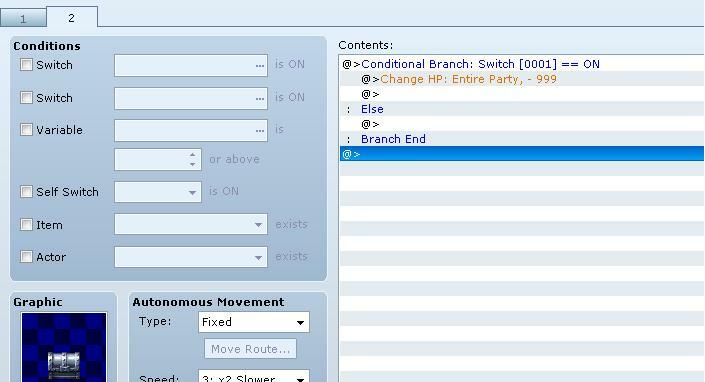 ...or you can just specify a custom page condition using a conditional branch that checks "Eric is a Monk?" 1: create a comment as the first command and write "page-condition"
2: create a conditional branch with the condition you want. The branches themselves are not important. I only check the condition and determine whether the page should be selected. An event is not refreshed automatically unless you explicitly tell it to refresh. I've added refresh calls to a lot of different methods throughout the classes but there may be some I didn't catch. Just report them. Night_Runner over at RRR decided to use a conditional branch to check for activation, which I think is a great idea. I've updated the script to use conditional branches as well (and also the original "script: .." comment if it's easier for you). Now all you have to do is do your typical conditional branch and the engine will correctly skip the page if the condition is not met (this allows you to run other pages). The first conditional branch is used to check whether the page should be used. It is still going to be checked when the interpreter actually executes the page commands. So the chest will suddenly turn into a dark chest and take your HP away if switch 1 is ON. 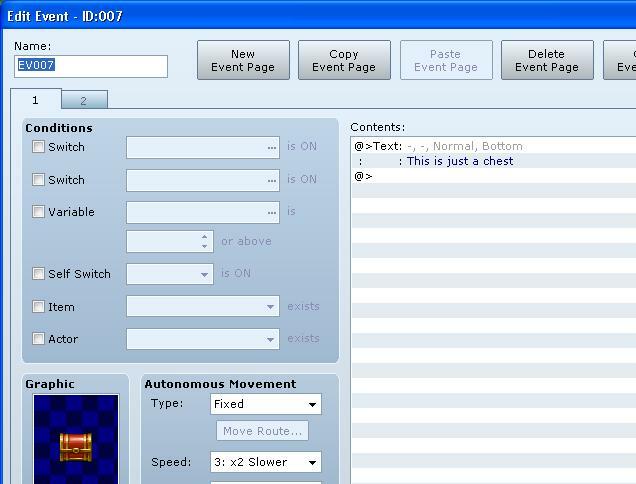 If switch 1 is not on, then the first page will be activated and you see your rest chest. Once switch 1 is on, it will turn into the dark chest. Technically, you don't need to put your commands inside the branch if you just want them to execute when the page is activated. You can still do it though; there is no issue. It changes how the page condition command is specified. Your first command should be a comment that reads "page-condition"
The second command should be a conditional branch that will be used as the page condition. Locked at OP's request. This script is no longer supported and you should use the new one as stating in the first post.